Recycle Rush starts with the autonomous period when robots can stack yellow totes and green garbage bins for 30 seconds to score extra points. Then during the teleoperated period, robots stack plastic totes in columns of up to six totes high with a green garbage bin on top containing a pool noodle for maximum points. The two alliances made up of 3 teams each are separated having half of the playing field each. 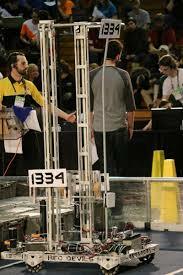 Alliances may also choose to do the optional coopertition stack with the opposing alliance to score additional points. Our drivetrain was a 6 Omni-wheel tank drive with 4 wheels powered. Our dual CIM motor intake with pneumatic arms had 2 horizontal wheels which clasped onto the tote and sucked it into the chassis. Then our dual CIM motor intake elevator (2 motors) lifted up the totes to create a stack. We were chosen as the third pick for the second alliance in the elimination matches! We are very grateful to alliance partners, teams 5406 and 3683 for choosing us! Our alliance ended the weekend in second place, earning us a spot at the World Championships in St Louis this April through the wildcard system! We won the Entrepreneurship Award thanks to all the hard work put in by our business team. We finished the qualifying matches in 13th out of 36 teams and took the second position in the fifth alliance, competing in the elimination rounds with teams 2185 and 4914. Even though we qualified for the World Championships, we were not able to attend due to the possibility of a secondary school teachers' strike. Aerial Assist is played with a 25” ball, which robots use to score points. Sending the ball through one of the ground goals is worth 1 point, and through a high goal on the wall is 10 points. There is also a metal truss spanning the middle of the field. Throwing the ball over the truss grants 10 points, while a robot catching the ball gains another 10. 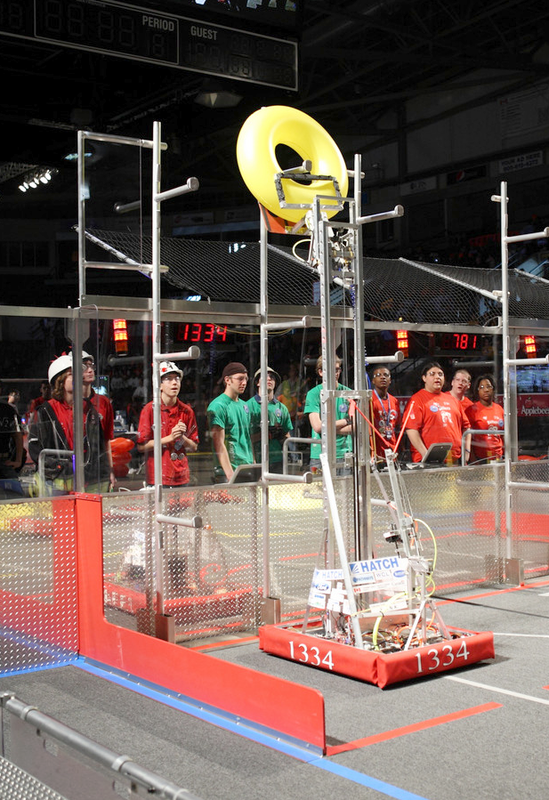 Additional points can be earned by passing the ball down the field between the 3 robots on your alliance. The drivetrain consists of rectangular aluminum tubing, 6 wheels dropped center tank drive, and 2-speed Vex Pro gearboxes. The shooter and pickup mechanism pivot together on top of 2 plasma cut aluminum towers. They pivot down to use the intake rollers and to ground pass the ball. The assembly then pivots skywards and releases two 42 lbs/in compression springs with a combined force of 500 lbs. These are then winched back in with an 800lbs winch system, with safety break rope to prevent catastrophic failures. The ball cradle rides on 32 precision roller bearings, for friction-less release. We received the Chairman’s Award, the most prestigious award in FIRST. This has been a longtime goal for our team and was extremely exciting. We would like to thank teams 2609 and 3756 for being our alliance partners during the elimination rounds. We won the Entrepreneurship Award based on our forward-thinking business plan. Also, our amazing mentor, Mrs. Decker won the Woodie Flowers Award. This award is for mentors who go above and beyond to help support their teams. Congrats Mrs. Decker! We also would like to thank teams 4914 and 2185 for being our alliance partners during the elimination rounds. We would like to congratulate our co-captain, Connor Sparling on being a Dean's List Finalist. We are proud to have won the Excellence in Engineering Award sponsored by Delphi as well as the Imagery Award in honor of Jack Kamen. We would like to thank our alliance partners 5184 and 5116, who we worked with to become Regional Finalists. The team spent an amazing few days a the World Championships learning lots and having tons of fun. We are very happy to have qualified and had the opportunity to meet teams from around the globe. We hope to be back again next year! Ultimate Ascent is played with two alliances of three robots which throw frisbees at goals of three different values. In the first 20 seconds, robots score autonomously and are then taken over by human control. 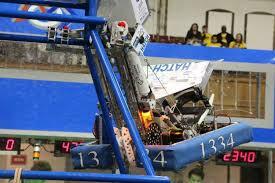 At the end of the game, robots can gain extra points by climbing a 10-foot high steel pyramid. Further points can be gained by placing specially marked disks in a basket at the top of the pyramid. The drivetrain consists of a 6-wheel tank drive where center wheels are dropped 3/32” lower than the outer wheels. They are 6” Colson solid plastic wheels with machined-in tread. Vexpro two-speed ball shifters. 2 CIMS each with pneumatic shifting. Direct drive to center wheels with #25 chain to outer wheels. The disc handling is loaded by the human player and launched by a pneumatic tire directly driven by a mini-CIM. Because of labour issues for teachers, all extra-curricular activities were canceled in December 2012. With teacher mentors not being allowed to participate, the team did not have access to the school shop until March 2013. We would like to thank Sheridan College, for allowing us to work in their shop during this time and the Oakville Yacht Squadron for giving us the use of their facility to set up a practice field. This was our first competition of the season. We were the 11th seed. We would like to thank our alliance partners teams 1241 and 4525 in making it to the semi-finals. This regional was a great success. At the end of the qualification matches, we were ranked third. Our alliance included teams 1310 and 3716 and went all the way to the finals, becoming Regional Finalists. We also won the Engineering Inspiration Award which qualified us for the World Championships. We won the Imagery Award for the first time and the team captain, Sam Thompson was selected as a Dean’s List Finalist. The team participated in the first annual Western Canadian Regional in Calgary. 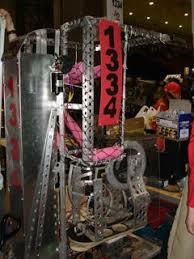 We led the pack at this event, were first seed and were Regional Winners, along with Teams 4334 and 4591. We also won the Excellence in Engineering Award sponsored by Delphi. The team was nominated into the Top 25 in FIRST. For our fourth time in five years, we attended the World Championship in St Louis, Missouri. By this time, teacher mentors were once again allowed to participate. The team was ranked 42nd out of 100 teams in the Archimedes Division and joined teams 1660 and 4450 in an alliance through the quarterfinals. This is the premier invitational off-season event and features 69 of the top teams in North America. In mid-July, seven students and four mentors drove to Indianapolis where the team had a record of six wins and three losses in qualifying matches. We were selected into the number one alliance and won the event with Teams 1114, 2056 and 2338. Our climbing mechanism, described as the smoothest in FIRST, worked almost perfectly through the weekend. We’ve already been invited to next year’s competition. This is an event conducted by the Centre for Surgical Invention and Innovation in Hamilton, Ontario. Teams – most not from FIRST – make a presentation on potential commercial applications of their robot. After partnering with the Oakville Fire Department, the team developed potential firefighting applications and won the High School Division. 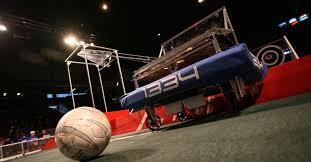 In Rebound Rumble, robots play basketball on two alliances of 3 teams each. There are 4 basketball nets at each end of the field with a steel barrier extending across the middle of the court. There are also 3 balancing bridges that extend across this barrier, linking the two sides of the court. In the first 15 seconds, robots must score autonomously and then are taken over by human control. At the end of the game, robots can balance on the bridges earning them bonus points. Balancing 2 or more robots gets extra points. At Waterloo, we were selected into the #5 alliance with FIRST Teams 1310 and 2702. We were defeated in quarterfinal action. The team won the Entrepreneurship Award and the Industrial Safety Award. This was our first time winning both of these awards. At the Greater Toronto West Regional, our performance improved such that we were sixth seed out of 55 teams and were the captain the #5 alliance joined by FIRST Teams 2013 and 772. After tough action, we lost in the quarterfinals. The team won the Gracious Professionalism Award and Mr. Wilks was named the Woodie Flowers Finalist. In Logo Motion, robots place inner tubes of various geometric shapes onto racks of different heights to create the FIRST logo. The higher the rack, the more points scored. The first 15 seconds of the game, robots are coded to place tubes on the rack in autonomous mode. Our team controls the next 105 seconds as we work together with the other two teams on our alliance to place as many tubes on the racks as possible. The final 15 seconds, a 'mini-bot' created from the vex kit to race up a pole for extra points. At Waterloo, we were 28th seed out of 29 teams but were selected to the #4 alliance with FIRST Teams 1074 and 2702 and went to the semifinals. For the third time, we won the Engineering Inspiration Award leading to our third trip to championships in as many years. Mr. George Chisholm won the Woodie Flowers Finalist Award. 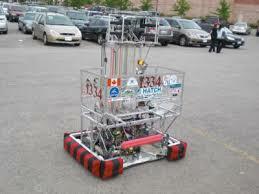 The following weekend at the Hershey Centre our robot did much better. We were 2nd seed out of 35 teams and set the #2 alliance with FIRST Teams 1325 and 610. We went all the way to the finals and won the Finalist Award. The team also won the Creativity Award and Nick Bandiera was selected as one of two Dean's List Finalists. At championships, we competed on the Galileo Field and seeded 22nd out of 88 teams. We weren't selected for an alliance. Nick Bandiera was selected as one of ten Dean's List winners. In July of 2011, the team competed at Innovation Nation, hosted by the Centre for Surgical Invention and Innovation at Deerhurst Resort near Huntsville. Three high school and three post-secondary teams competed and demonstrated commercial applications of their robots. 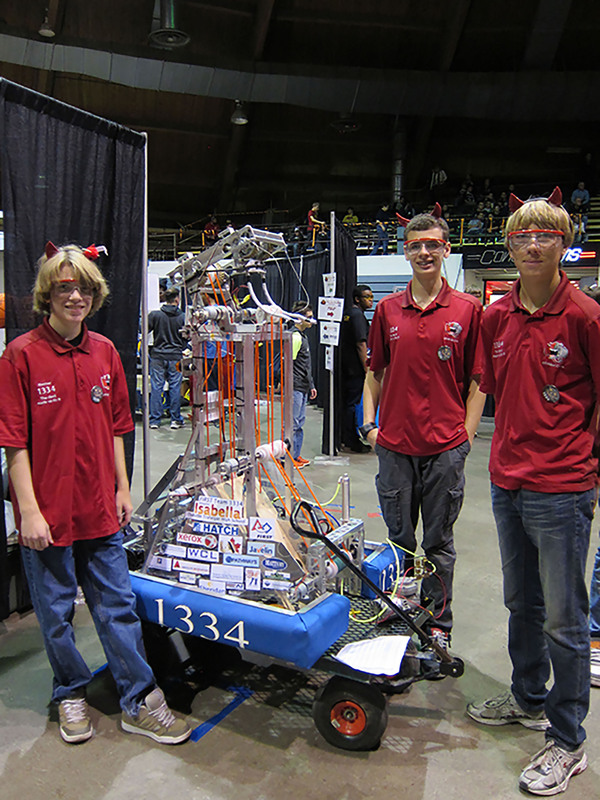 FIRST Team 1334 won the platinum prize over all other teams present. Grace is designed to play Breakaway. In this game, two alliances of three robots kick or herd balls into goals located at the corners of the field. The field of this game is filled with obstacles, including bumps and tunnels for robots to maneuver during gameplay. The first fifteen seconds of the match includes an autonomous mode where robots are programmed to kick balls themselves into goals. Each ball scored earns one point. At the end of the game, bonus points are awarded for robots that cling onto either of the two towers in the center of the field. If all of the alliance bots are suspended, extra points are awarded. In our first competition of the year at Waterloo, we were 19th seed out of 30 teams and weren't selected for an alliance. The team was awarded the Gracious Professionalism Award. In the inaugural year of Dean's List, Evelyn Wainewright was selected as one of two finalists. At the Hershey Centre the following weekend, we were 11th seed out of 52 teams. We set the #8 alliance with FIRST teams 1535 and 2935 but went out in the quarterfinals. We also won the Engineering Inspiration Award setting us up for our second trip to the Championships in Atlanta. At the Championships, we competed on the Curie Field and seeded 80th out of 86 teams. Cory Sulpizi received the Young Mentor Award at the FIRST Lego League Halton Regional Competition. Fred is designed to play Lunacy; this game was played with three robots per alliance, each alliance being assigned the two corner positions at either end of the field. Robots were equipped with wheels specific to the game to reduce friction on the field. 'Moon Rocks' were used to score points for the alliance; orange and purple gaining 2 points each, empty cells coloured orange and blue were worth two points each and super-cells coloured green and purple were worth 15 points each. Super-cells were achieved by the robot handing off an empty cell to the human player during the game period and can only be put into play during the last 20 seconds of the game. The autonomous period lasted 15 seconds of preprogrammed shooting while team members operated the two minutes remaining. At Waterloo, we were 12th seed out of 26 with a record of 9-8-0. After being selected into the #6 alliance with FIRST Teams 781 and 2200, we made it all the way to the finals, won the Finalist Award and the Engineering Inspiration Award which led to our first trip to the Championships in Atlanta! Overdrive was a game played on a field made into a track. Instead of the standard autonomous mode, the robots race around the track doing as many laps as possible using inferred controllers. The game piece, a 40in diameter 'Trackball' which was used to manipulate in order to score points. Points were awarded for knocking off track-balls from the overpass, having robots cross the finish line or the opponent's finish line and when the trackball itself is hurdled over the overpass. Rack n' Roll included a large metal contraption with three levels of hanging metal bars in an octagonal pattern. Each arm is able to place two inflatable tubes onto the bar. During autonomous mode, 'Keepers', or tubes with writing on them are placed onto the racks, 'Ringers' are undecorated tubes placed onto the field by the human player are placed on the opposing zone for the teleoperated mode. 'Spoilers' are black tubes which when placed onto the arm; cause the tubes on the arm of the rack to be ignored during scoring. The end game is the final fifteen seconds of the game where robots are not allowed to interfere with the opposing alliance's racks. At the Waterloo Regional, we were 17th seed out of 30 teams with a record of 6-8-0. We were selected into the #4 alliance with FIRST Teams 188 and 1592 but were defeated in the quarterfinals. The following weekend at the Hershey Centre we were the 2nd seed out of 63 teams with a record of 8-3-0. We set the #2 alliance with FIRST Teams 2166 and 610 but were defeated in the quarterfinals. Aim High is a competition where robots compete to gain points by delivering balls into goals and positioning robots in certain points of the playing field. The ten-second autonomous mode allowed robots to score into any of the three goals. The alliance with the most points at the end of autonomous mode was awarded ten points and the defensive position during the next portion of the game. Robots then take turns playing defense throughout rounds two and three to score points and round four included any alliance scoring to gain points. 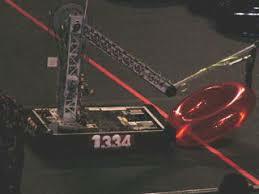 The end of the match provided bonus points for placing its three robots on a platform below the center goal. At the Waterloo Regional, we were 19th seed out of 30 teams with a record of 6-6-0 but were not selected for an alliance. At the Greater Toronto Regional we were 34th seed out of 74 teams and were selected for the #8 alliance with FIRST Teams 1053 and 1392 but went out in the quarterfinals. Evelyn Wainewright received the Young Mentor Award at the FIRST Lego League Halton Regional Competition. Triple play was a game including our robot and two others to form an alliance. The robot played a game similar to that of tic tac toe, teams earn points by scoring tetras into goals and creating rows of your alliance's colour to earn the highest points. Extra points were awarded at the end of the game if all robots in the alliance were behind the alliance line at the end of the game. The team for further play could keep tetras knocked down during autonomous mode in the following time of the match. In 2005 we competed in the inaugural Waterloo Regional and were 8th seed out of 24 teams with a record of 6-4-2. We set the #5 alliance and were semi-finalists with FIRST Teams 1006 and 781. The following weekend we competed at the Greater Toronto Regional where we were 12th seed out of 66 teams. We led the #8 alliance with FIRST Teams 1053 and 1392 but went out in the quarterfinals. 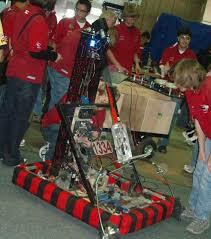 In 2004, our robotics team entered its first year in the FIRST community. Teams could score by having their human player score purple balls in goals, capping a goal with a ball or hanging their robot from the 'chin up' bar. This game was played with our robot and one other team to form an alliance in qualifying matches and two other teams in elimination rounds. Small yellow balls were worth ten points and purple balls were worth five points, placing a yellow ball on top of the goal awarded a double score. The fifty-point bonus was awarded if the robot could hang off of the chin-up bar at the end of the match. In the autonomous mode, robots must knock a small yellow ball off of a pole to release balls above the team station. Our Rookie Season. The team competed at the Canadian Regional Competition at the Hershey Centre and ended up 34th seed out of 75 teams with a record of 5-4-0.